Dinner will be ready in a less than half an hour with these 20 minute Italian turkey sausage and vegetable couscous bowls, perfect for a quick and easy weeknight meal. Sooooooo….does this happen to anyone else, or is it just me? Every few months I feel overwhelmed at the accumulation of stuff in my fridge/freezer/pantry? I exclaim to my husband that we are not to buy anything until everything is used up, but then about three meals in when I’m running out of ideas, the creative meals using the stuff we have just go out the window and so does the resolve…and the shelves get piled back up with random stuff. Not this time though, this Spring I’ve resolved to go through our pantry at a minimum and use up what we have on hand (supplementing in fresh produce of course). And can we talk about the fact that it is SPRING already? As in, it’s almost MAY! Yikers!! Time is definitely getting away from me! I love that in Spring you see asparagus everywhere. This past weekend I was in Michigan on an amazing blogger retreat I was one of the cohosts of (I’ll be sharing more on that soon) and on the drive back, I saw a little sign for some fresh asparagus at a road side stand and had to stop. It was the perfect excuse to make these Italian turkey sausage and vegetable couscous bowls with again (I love how simple and easy they are to make). You could make these with a pre-chopped mix of asparagus, mushrooms and onions (I bought the pre-chopped mix at Trader Joes, pre-chopped veggies really reduce cooking time, so whenever I find them I buy them) or you can make your own mix of veggies based on what you have on hand. These bowls are totally customizable to what veggies you have on hand, you want about 2 1/2 cups of raw veggies. To make this dish you’ll saute vegetables in a little olive oil, and then add ground Italian turkey to the pan and cook it all together. 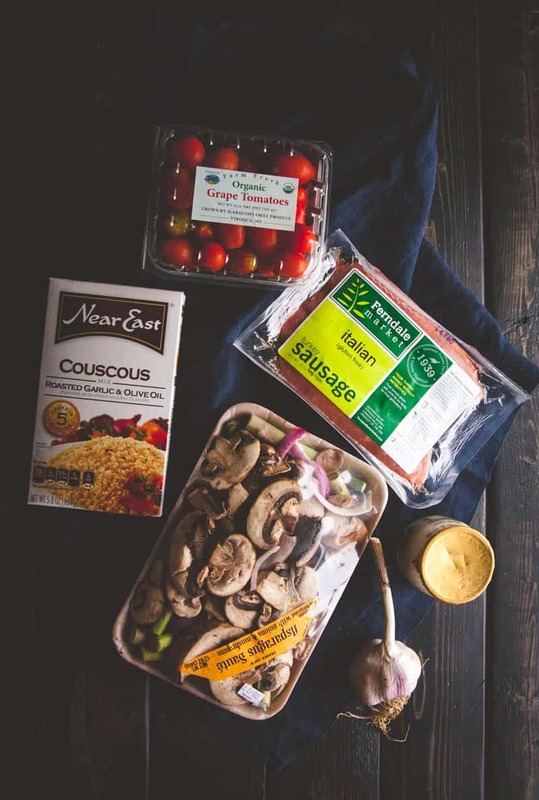 While the veggies and turkey are cooking, you’ll make the couscous and yogurt sauce (just crushed garlic and plan yogurt stirred together) and then you’ll make bowls by topping the couscous with veggies and turkey and a dollop of garlic yogurt sauce. This delicious dish was the first dish that I made to start cleaning out my pantry and freezer (maybe I should do a #cleaningoutmypantry project ? I’m going to be sharing on my creations on Instagram using that hashtag, along with #sweetphiblog as always, and if you make a dish using up ingredients in your pantry, you should use #cleaningoutmypantry because I’d love to see what you make with what’s around the house!) Items used from the pantry in this dish are the box of couscous and the Italian turkey sausage from my freezer, and it was so good and something I’ve now made multiple times over! Something else I love is when people reply to my newsletter and tell me how they’ve made one of my recipes or they ask a question, or simply want to say hi! I love getting emails from you guys, so I encourage you to reply or email me any time! Do you ever try and clean out your pantry and end up making a delicious meal? 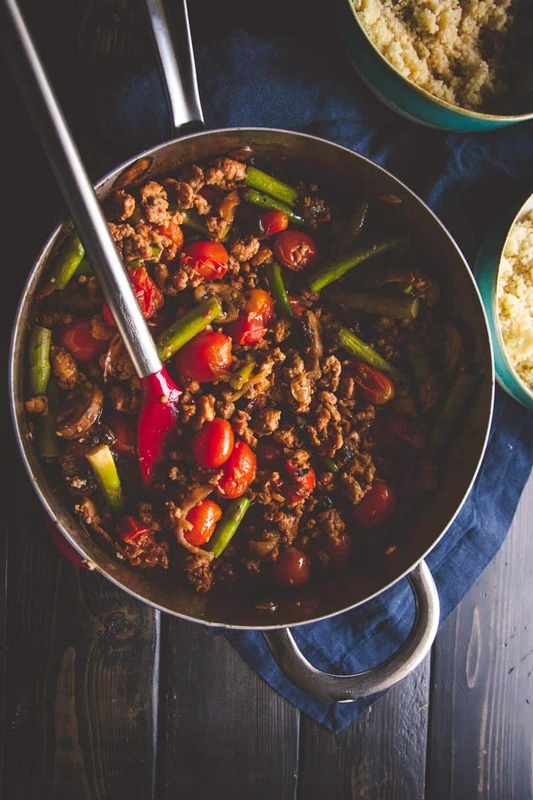 In a large skillet let olive oil and 1 pressed garlic clove cook for 1 minute, then add in the mixed and chopped veggies (asparagus, onions, and mushrooms) and the grape tomatoes and sprinkle with salt. Let cook for 2 minutes, then add in the ground turkey sausage and break up and stir the turkey as it cooks. Cook the turkey and vegetables until the turkey is cooked through, about 15 minutes. Meanwhile, cook the couscous according to package instructions and set aside. Also make the yogurt garlic sauce by combining the yogurt and 2 remaining garlic cloves, stir. 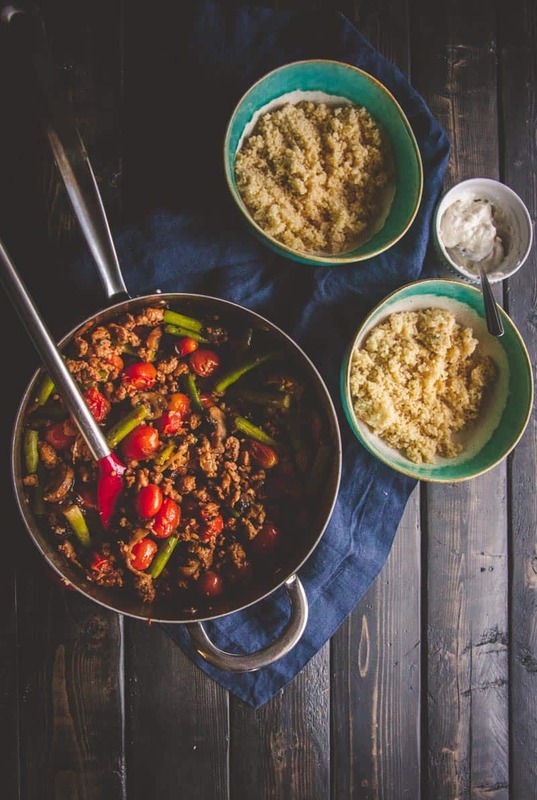 To assemble the bowls, divide the couscous into 4 bowls, then top with a quarter of the meat and veggie mixture, and add a dollop of the yogurt garlic sauce on, then enjoy! We are in that stage at the moment. We have so much food, although we can never seem to find anything to eat, that we have stopped buying stuff. We really don’t use couscous enough though, and I know I have some hiding somewhere. Love a quick easy weeknight meal my kids will eat! Thank you so much Karen, these turkey sausage couscous bowls are a great way to get veggies in and a delicious meal the whole family will love! I have some last of the “veggie sausage” in my freezer (trying not to use any processed foods anymore) so I’m going to make this recipe with that! Thanks for a quick weeknight meal idea! I do that too with the buy one get one, and then I’ll have SO much of one thing left over lol- glad I’m not the only one! And bellinis? YUM! This recipe would be perfect with veggie sausage, thank you so much for commenting! 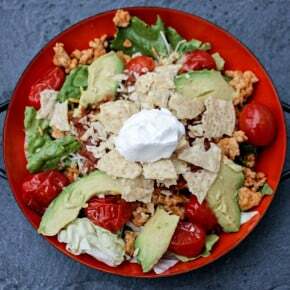 Hi Phi, couscous is one of my favorite grains, love these turkey and veggie bowls, they are right up my alley. Can’t wait to hear about your retreat. hey girl this looks yummy! Yes I do try to clean out our pantry and find something to make! I try to be creative! I’m totally the same way about letting lots of things accumulate in the fridge! It’s always satisfying to use something up and get it out of there, haha! 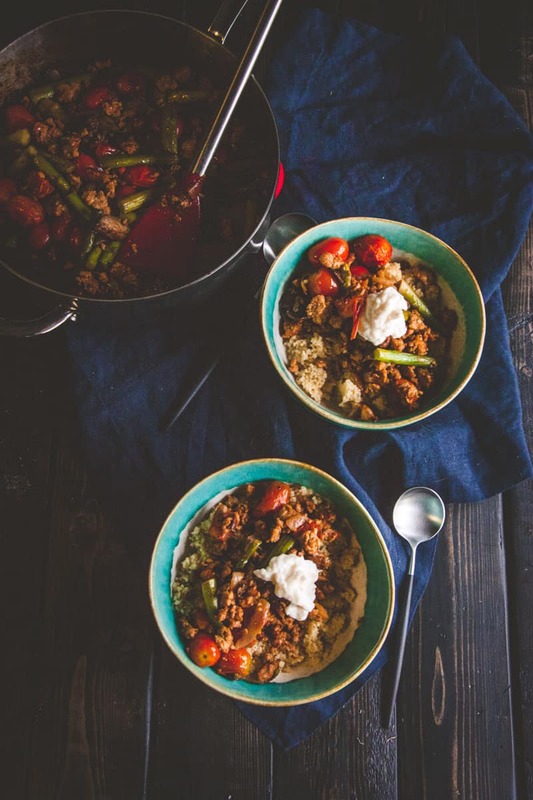 These sausage and vegetable cous cous bowls look outrageously delicious and perfect for dinner. Isn’t it crazy how it all accumulates? 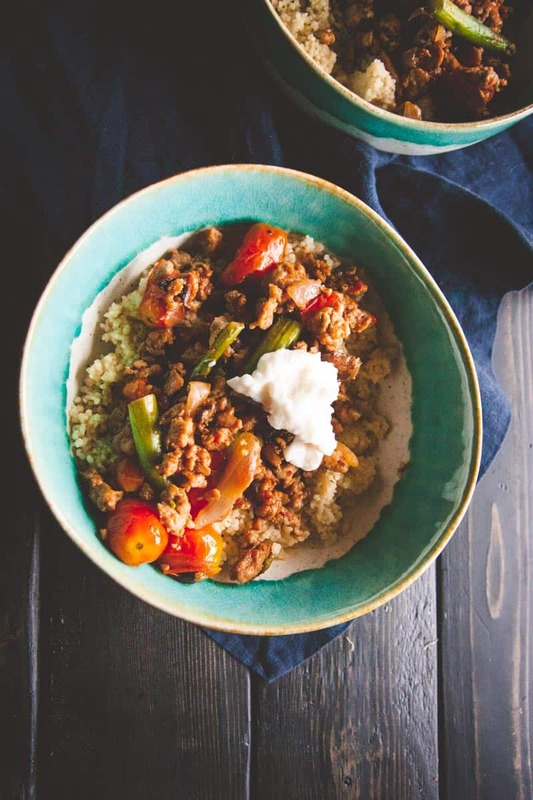 It does feel so good to use things that I already have in creative ways – and these turkey couscous bowls are something I’m totally in love with, I just made them again this week! haha yup I totally have that problem! I actually have a huge tub of couscous right now that needs to be used up! 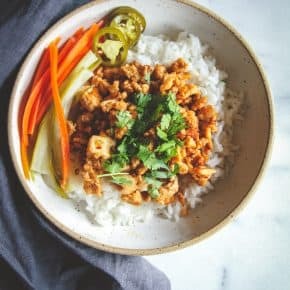 This dinner sounds awesome – so simple!